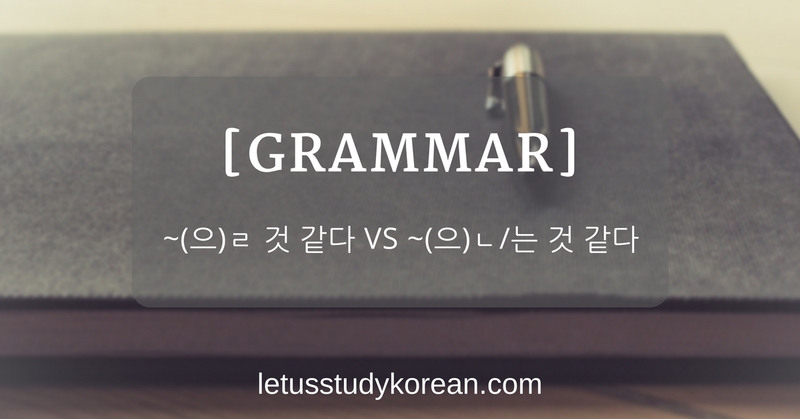 ~(으)ㄹ/(으)ㄴ/는 것 같다 is probably one of the most used grammar particles in everyday conversations, business settings and basically everywhere! You would have heard this so much in dramas that you probably could recognise it right away. Very quickly, ~(으)ㄹ/(으)ㄴ/는 것 같다 translates to “it seems that” or “I think”, basically a guess or making an uncertain statement. In this blog post, we’ll explore in-depth how to use ~(으)ㄹ 것 같다 and ~(으)ㄴ/는 것 같다 differently and accurately. I did some research and my Korean teacher (Ms Goo Hara, thank you!) at Daehan explained some of the most important differences. Be sure to leave comments if you have anything to add/clarify! 1a. ~(으)ㄹ 것 같다 is used to express a weak guess. But apparently in Korean, ~(으)ㄹ 것 같다 shows a very weak and soft guess, sometimes to be polite. Often times, this is because there is either little or no evidence to support the guess. 지금은 배고 안 파서 이따가 먹을 것 같아요. I’m not hungry now so I think I will probably eat later. 다음 주에 손님이 올 거라서 내일 청소(를) 할 것 같아요. Guests will come next week so I think I will probably do cleaning tomorrow. 이번 주말에 시간이 돼서 같이 먹으면 좋을 것 같아요. I am free this week so I think it will probably be good if we eat together. 여기 맛집은 텔레비전에서 나온 적이 있어서 음식이 아마 맛있을 것 같아요. This famous restaurant came out on television before so I think the food will probably be delicious. 계산대에 앉아 있는 여자는 아마도 사장님일 것 같아요. The lady sitting at the cashier counter, I think she will probably be the boss. 1b. ~(으)ㄹ 것 같다 can only be used to express something the speaker has not yet experienced or happened. Because this grammar particle is using ~(으)ㄹ which is indicating something in the future, therefore it’s always only used when it’s something that hasn’t happened yet or something the speaker has not yet experienced. Yesterday, my elder sister was not hungry so I think she probably didn’t eat. Wow, it’s really dirty. Perhaps, I haven’t done cleaning yet. I am free this weekend so I think it will probably be good if we eat together. We ate deliciously together last week so I think it was probably good. This famous restaurant came out on television before so I thought the food was probably delicious. The lady who was sitting at the cashier counter yesterday, I think she was probably the boss. 2a. ~(으)ㄴ/는 것 같다 is used to express a stronger guess than ~(으)ㄹ 것 같다. When the speaker is more certain of the facts and is able to gather some substantial evidence, he or she would use ~(으)ㄴ/는 것 같다. In most cases, it’s usually something the speaker knows already but doesn’t want to make certain statements to be polite, tactful or just to soften the tone. In some cases, the speaker is certain of the fact but do not wish to sound too straightforward. 2b. ~(으)ㄴ/는 것 같다 can only be used to express something the speaker has/had already experienced or happened. An extension of the previous point and in contrast to its ~(으)ㄹ counterpart, ~(으)ㄴ/는 것 같다 is usually used to describe things that have/had happened. That’s also why the speaker would know of some partial facts or pieces of evidence to support his or her guess/claim/statement. In almost all cases, using ~(으)ㄴ 것 같다 indicates past tense for verbs and ~았/었/였/했는 것 같다 for adjectives, while ~는 것 같다 indicates present tense for verbs and ~(으)ㄴ 것 같다 for adjectives. They all weight the same on the certainty scale (if there is even such a thing), though. It’s lunch time so I think the boss is probably eating. Lunch time is over now so I think the boss probably had eaten (already). The boss went into the meeting room just now so I think she is probably having a meeting now. The boss came out of the meeting room so I think she probably had a meeting (just now). Teacher Kwak taught me well all this while so I think it is probably good to learn from Teacher Kwak. Teacher Kwak taught me well all this while so I think it was probably good to learn from Teacher Kwak. Those people are eating really fast so I think it is probably delicious. Those people were eating really fast so I think it was probably delicious. 사장님인 것 같다 = I think it is probably the boss. The lady sitting at the cashier counter, I think she is probably the boss. Same rules apply but not as commonly used; ~(으)ㄹ/(으)ㄴ/는 것 같다 particles are usually used with verbs and adjectives. Hope you’ve understood (more or less, at least, I hope…)! If not, please leave comments below and we can discuss about it! 좋았는 것 같다 is not correct. korean is not using 좋았는 것 같다. 한국인인데, 한국어 문법에 대해서 찾다보니까 당신의 블로그를 찾게 됐어요. 당신이 한국어 문법을 해박하게 잘 알아서…사실 이 글을 한국인이 영어로 쓴 줄 알았어요…ㅋㅋㅋ 읽다보니 한국어 어휘의 미묘한 차이를 잘 알고 있어서 놀랐어요. 실제로 한국에 살고 있나요? 아니면 그저 배우기만 한 거예요? 정말 대단해요…한국인안테 설명해보라고 하면 이렇게까지 잘하는 사람은 많지 않을 거예요. 안녕하세요, Vance가 너무 바빠서 동료인 제가 대신 댓글 달아요! 🙂 자기소개글 보시면 알겠지만 Vance는 한국인이 아니에요! 혼자 이렇게 공부해서 문법 글도 쓰고 정말 대단하죠?